Pesto Stuffed Roasted Tomatoes are a must make side dish/ appetizer. 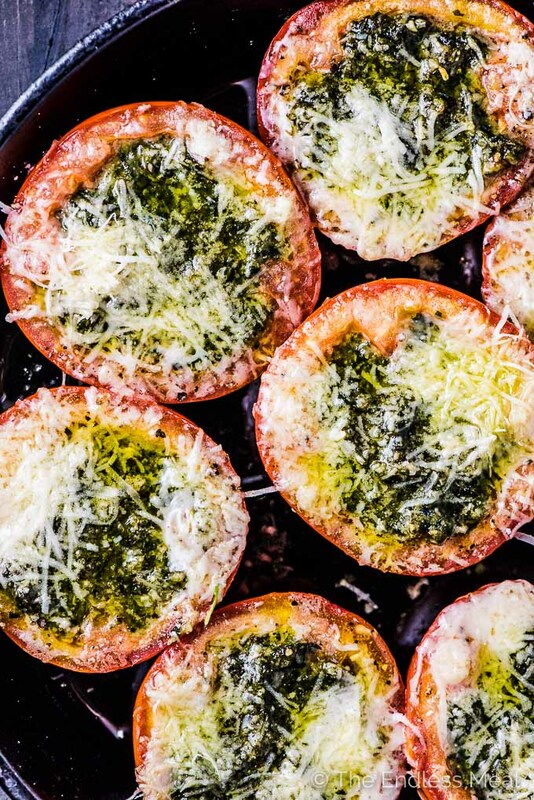 The hollowed out tomato halves are stuffed with an easy to make, garlicky pesto then roasted until the cheese melts and the tomatoes are soft. They're delicious! It's Throw Back Thursday and these pesto stuffed roasted tomatoes are making a comeback! The first time I shared this recipe with you was back in 2012. The original photo was so unappetizing that I hesitated to share it with you today. I've hidden it a few pics down so you can have a laugh with (at) me. I love #tbt cause I get to remake some of my favorite older recipes. 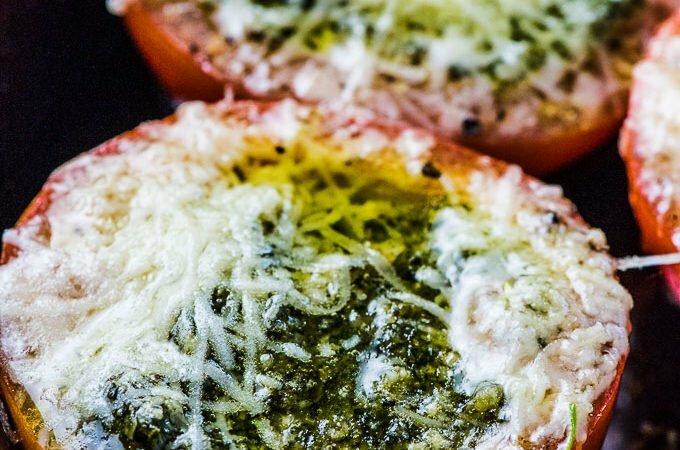 This pesto stuffed tomatoes recipe is still on the top of my list of favorite side dishes. 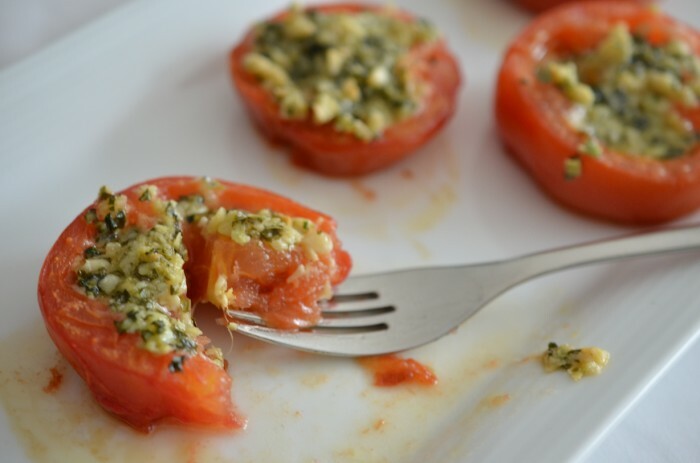 Flavorful roasted tomatoes with pesto and parmesan are all things delicious. Pesto is a personal favorite and this garlicky version is the best in roasted tomatoes. They're a side dish that goes with just about anything you're serving. They transform easily into an appetizer. 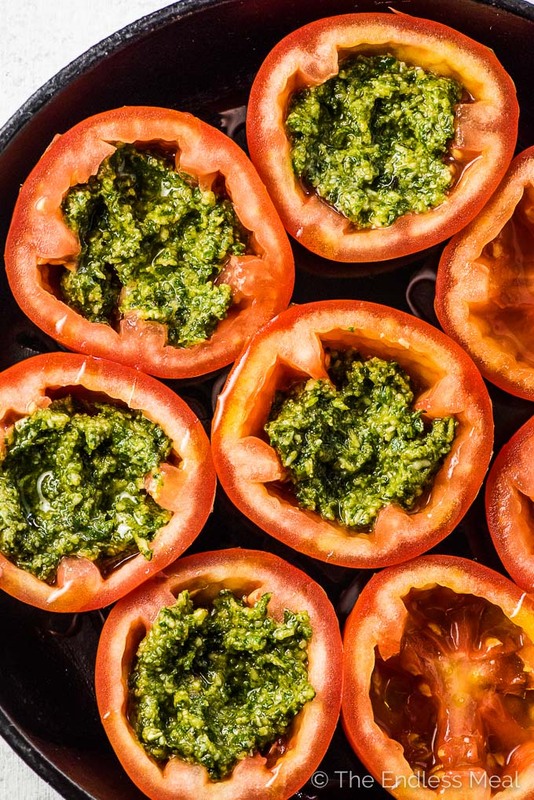 Serve them at the start of your meal and voila, you have a pesto stuffed tomatoes appetizer! This is a super easy to make recipe. If you can whizz a few ingredients in your food processor or blender and cut a tomato in half then you can make this. 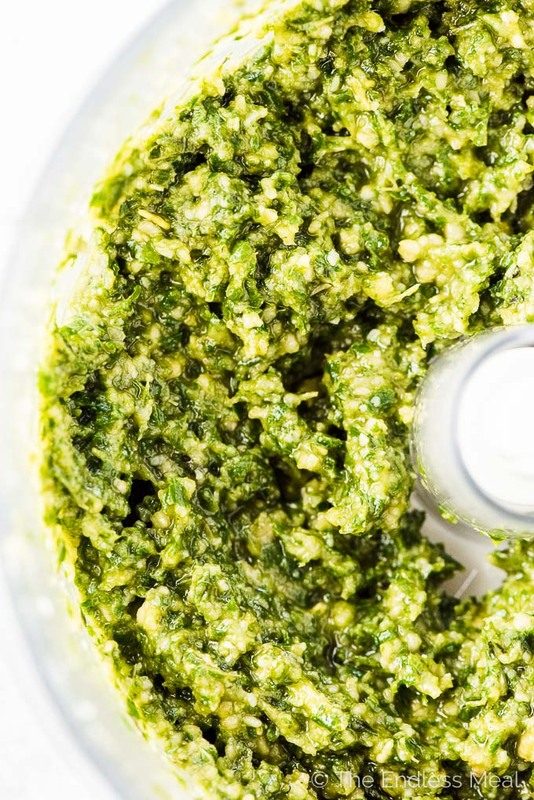 This is a super simple, 5-ingredient pesto recipe. Five if you don't count the salt, which I never do. Why count something that no recipe can live without? It's heavy on the basil, garlic, and parmesan. This isn't a pesto you'd want to toss on pasta but it's perfect stuffed into tomatoes and roasted in the oven. The garlic gets toned down a little when the pesto is cooked, which is why I like to use 3 whole cloves in here. You'll also notice that there's no lemon juice in this pesto. It's almost sacrilegious, I know. Because we're using it to stuff into tomatoes, we don't need the extra acidity. Warning: If you taste this pesto before you dig into the tomatoes, you'll think that it's too salty. On its own, it is too salty. Just remember that it has to be salty enough for both the pesto and the tomatoes. Once you've made your garlicky pesto (that shouldn't take you any more than 2 minutes. this is seriously fast pesto) you'll want to use it to stuff the tomatoes. For the pictures, I used basic beefsteak tomatoes. If you have some nice heirloom tomatoes, go ahead and use those. 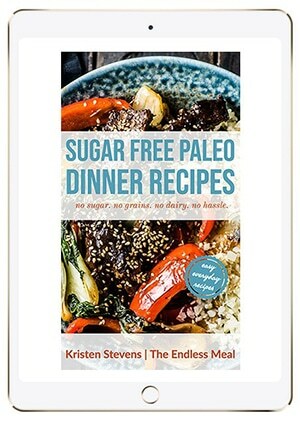 They'll make this recipe even better! I'm tempted to start this post with, “OMG these are the most delicious, yummiest, addictive tomatoes you will ever eat.” But what does all my superlative ranting really mean anyway? It means: these are the most delicious, yummiest, addictive tomatoes you will ever eat. Seriously. It's been less than 24 hours (closer to 17 actually), and I've already polished off the second batch of these warm, cheesy, garlic-y, basil-y, tomatoes. Would it be too much to make them for dinner again tonight? No, not at all? Awesome. I think I will. I polished off a big plate last night for dinner while flipping through the newest Bon Appetit that arrived in the mail. Today I ate an even bigger plate while sitting in front of my computer. But you don't need to be so hermit-like while eating these. These pesto stuffed roasted tomatoes would be so pretty on a plate next to roast chicken or on top of a big pile of baby greens. Made with little cherry tomatoes I'm sure they would be the first appetizer to go at any party. If you’re interested in learning a few tricks that I did to improve my food photography, check out the posts 10 Food Photography Tips for New Food Bloggers and The 10 Best Food Photography Props to Improve Your Food Photography and The Food Photography Equipment I Use. Pesto Stuffed Roasted Tomatoes are a must make side dish/ appetizer. 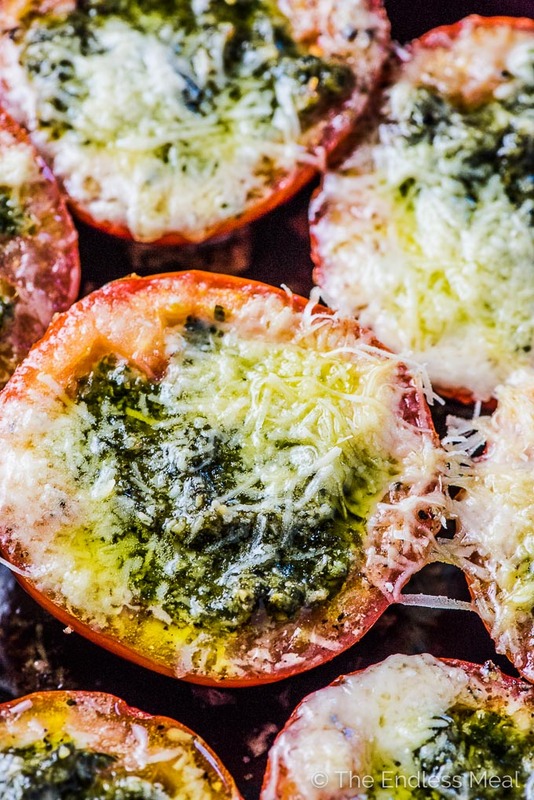 The hollowed out tomato halves are stuffed with an easy to make, garlicky pesto them roasted until the cheese melts and the tomatoes are soft. They're delicious! Preheat oven to 350 degrees. Hollow out each tomato half and nestle them into an ovenproof baking dish or cast iron pan. Place the basil, 1/4 cup of the parmesan, pine nuts, olive oil, garlic, and sea salt into a small food processor and blend until a chunky pesto forms. Stuff the tomato halves with the pesto (about 1 tablespoon per tomato half) then top with the remaining parmesan cheese. 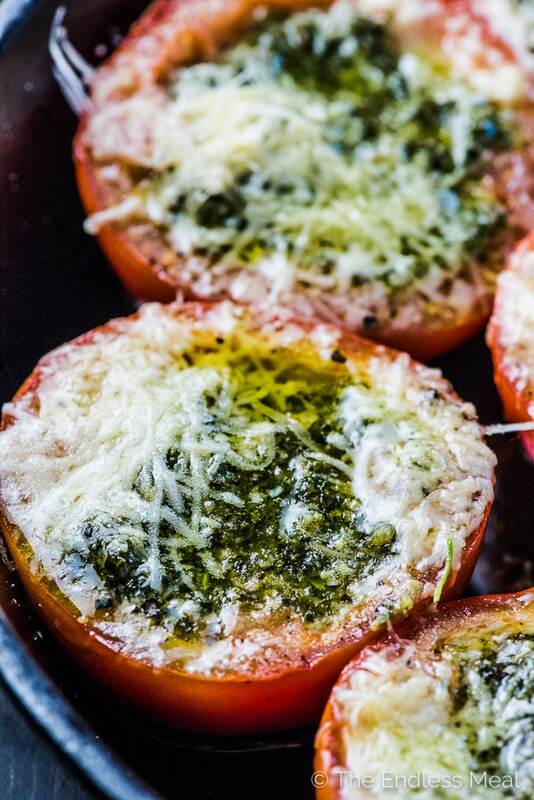 Roast the pesto stuffed tomatoes for 20-25 minutes, or until the tomatoes are soft and the cheese has melted. Made these for brunch this weekend with some eggs and toast and they were amazing. So much flavor! They’ve been requested for next week’s brunch! Sounds like the perfect brunch!! 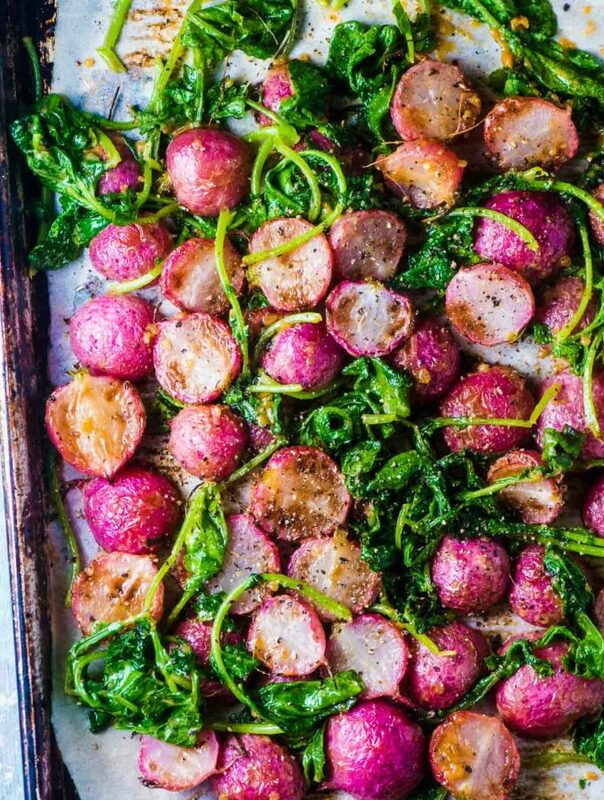 I made these as a side dish for dinner….amazing!!!! I didn’t have any parm on hand so used fresh mozzarella. Excellent!!! Great call on the mozzarella. I bet they were extra cheesy and delicious!! OMG! I love roasted tomatoes and the pesto just sends them over the top! The perfect breakfast side. They really are one of our all time favorites!! I tried these last night and they were really tasty. Thank you so the recipe! 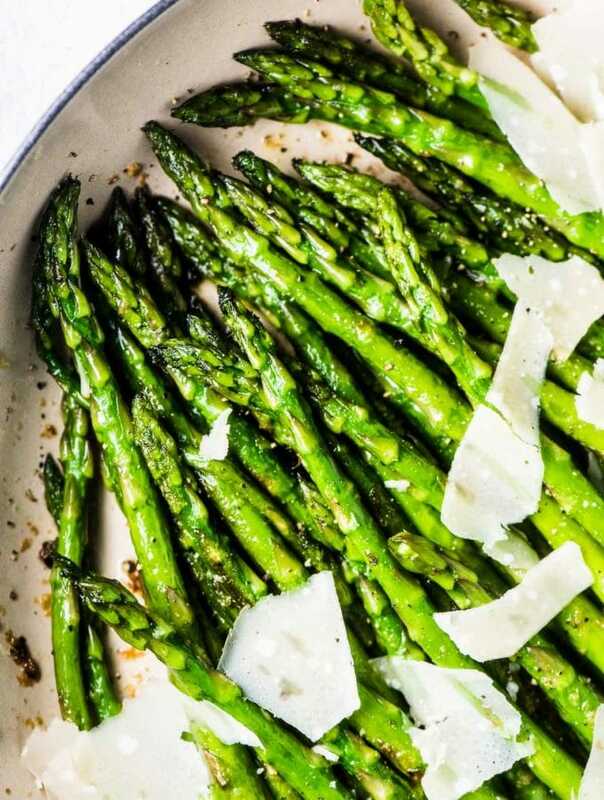 I love these – would make them all the time last year (awesome with garlic pesto too). Can’t wait to make them again with warm from my garden tomatoes!!! Hmmm… bake? What temp? Or should I just cook them stovetop? Medium heat? Can you tell me what temp you set the oven too? This sounds great, especially with some crusty bread on the side. Oops forgot about the oven temp 🙂 I baked them in a cast iron skillet at 350 degrees. They’ll work great on an oiled baking sheet too. Some crusty bread would be perfect with these!